George Bush and Graves' Disease | Crank It! Although George Bush, the forty-first President of the United States, was the fifth oldest president to hold that office, he was considered by many to be one of the most physically fit presidents in American history. Therefore, it was all the more shocking when, at the age of 66, President Bush was hospitalized because of a heart condition. When medical tests confirmed that an autoimmune thyroid disease was the real culprit, the public was even more puzzled. While jogging around the grounds of Camp David on a Saturday afternoon in May 1991, the President experienced shortness of breath, tightness in his chest, and a general feeling of fatigue. A White House physician examined him and discovered that the President’s heart was beating rapidly and irregularly. Realizing that the President was experiencing atrial fibrillation, he immediately arranged for the President’s admission to Bethesda Naval Hospital. When giving information for his medical history, President Bush stated that he had been feeling increasingly tired during the two weeks preceding his hospitalization. In addition, he had lost nine pounds in two months, and his handwriting had deteriorated. Physical examination revealed a fine tremor of his hands and a slightly enlarged thyroid gland (goiter). Initial tests ruled out underlying heart disease as the cause of his atrial fibrillation. Further testing revealed that the President was suffering from hyperthyroidism (too much thyroid hormone) caused by Graves’ disease. The excessive hormones were overstimulating the President’s heart and disrupting its normal rhythm. Graves’ disease is an autoimmune disease and the leading cause of hyperthyroidism in this country. To date, researchers have not been able to discover what actually causes the immune system to go awry, but they have discovered some revealing characteristics of autoimmune disorders. In general, an autoimmune response occurs when the immune system incorrectly identifies parts of healthy cells in the body as “invaders” and produces antibodies to attack these cells. There seems to be a genetic predisposition, especially among women, to develop autoimmune diseases. In addition, people with one autoimmune disease are more likely to develop other autoimmune disorders. Graves’ disease can affect the thyroid gland, the eyes, and the skin. In Graves’ hyperthyroidism, antibodies attack sites in the thyroid gland that capture TSH (thyroid stimulating hormone). These antibodies then begin to function like TSH; however, they stimulate the thyroid gland to make and secrete excessive thyroid hormone. 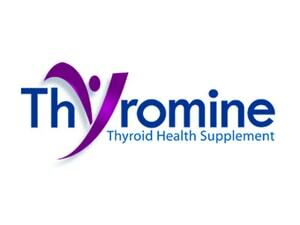 Excessive thyroid hormone can cause any number of signs and symptoms. The most common signs and symptoms of Graves’ hyper-thyroidism are an enlarged thyroid gland (goiter), fatigue, nervousness, irritability, increased sweating, an inability to sleep, and weight loss. As noted, President Bush did not experience some of the more common symptoms of Graves’ hyperthyroidism. In fact, patients over the age of 60 do not typically have the same signs and symptoms as younger patients. Instead, they may have only one organ affected, such as the heart. President Bush and the team of physicians caring for him agreed that his hyperthyroidism should be treated in the safest, fastest, most definitive, and permanent way possible. Therefore, he took an oral dose of radioactive iodine a few days after being admitted to the hospital. 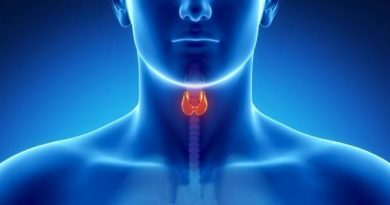 Hyperthyroid patients who are treated with radioactive iodine or surgery can experience a relatively uncommon health crisis called thyroid storm. Thyroid storm is a life-threatening condition that occurs if too much thyroid hormone is suddenly released by the thyroid gland. It can be prevented by administering certain drugs that can block this sudden release. Therefore, two days after taking radio- ctive iodine, President Bush began taking four drops of SSKI (potassium iodide) three times a day for ten days to assure that he would not go into thyroid storm. Even though his endocrinologists believed that the positive effects of the radioactive iodine would be noticeable within one or two weeks, they knew it would take two to three months before the President’s thyroid hormone level would return to normal (euthy-roidism). Because of Mr. Bush’s position and responsibilities as President, it was especially important to reduce his thyroid hormone levels as soon as possible. By choosing SSKI to prevent thyroid storm, his doctors were also giving the President a medication that starts to reduce thyroid hormone levels within hours and reaches its full effect within a few days. PTU (propylthiouracil) and Tapazole® are other drugs sometimes given to prevent thyroid storm. However, it can take seven days before these drugs start to reduce hormone levels and two to three weeks to reach their full effect. Dr. Allen M. Ross, the cardiologist caring for President Bush, treated the atrial fibrillation with a combination of drugs: procainamide and digoxin to control the irregular heartbeats and Coumadin® to protect against blood clotting. As the President’s thyroid hormone levels became normal, these drugs were tapered off. Understandably, the President was concerned that his medical problems would affect his work schedule. Although he was allowed to return to work, he was advised not to overexert himself. His physicians told him that he would continue to feel tired until his thyroid hormones approached a normal level. However, they assured him that he could resume his full level of activity in one to two months. For several weeks, both his thyroid levels and his heart were monitored very closely. As anticipated, within a few months, the President’s thyroid gland was no longer producing enough thyroid hormone, causing him to become hypothyroid (too little thyroid hormone). At that point, he began taking thyroid hormone replacement. Fortunately, President Bush rebounded quickly and completely. According to Dr. Ross, “President Bush was extremely fortunate to have had a completely curable form of heart disease, one caused by an excess of thyroid hormone, which quickly responded to treatment. Most heart patients are not so lucky.” The radio-active iodine treatment effectively ended the President’s hyperthyroidism, and brand-name levothyroxine taken daily maintains the proper level of thyroid hormone (euthyroidism) in the former President. When the public became aware of the President’s thyroid disorder, there was a flurry of speculation about autoimmune disease in the White House. Eighteen months before the President’s ordeal, Barbara Bush was also diagnosed with Graves’ disease. Unlike her husband, she also developed Graves’ eye disease (see The Thyroid Connection, Volume II, No. 1). The odds of both husband and wife developing the same autoimmune disease over their lifetime are more than one in 10,000. The odds increase to one in three million that it could happen within a two-year period! When Millie, the Bush family dog, developed lupus (another autoimmune disease), some people speculated that there must be something in the White House water. However, his physicians concluded that, most likely, it was simply coincidental that President and Mrs. Bush and Millie developed autoimmune diseases. Now retired from public office, George Bush continues to lead a vigorous and full life, filled with a variety of physical activities and adventures. According to his personal physician, Dr. Benjamin Orman, “Mr. Bush does not look his age, is unusually healthy, exercises frequently, and continues to go at a brisk pace.” To the amazement of many, on April 1, 1997, President Bush fulfilled a promise he made to himself during World War II when he was forced to eject and parachute from his burning bomber. Demonstrating his vitality at age 72, he jumped from an airplane, zipped through the sky, pulled the rip cord of his parachute, and smoothly floated down to Earth. 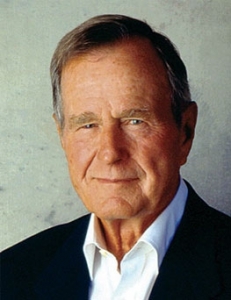 The Bushes’ experience and openness in dealing with Graves’ disease has helped to focus attention on a disease that affects millions of Americans. Much needed discussion about the nature and treatment of their disease has increased public awareness and understanding. By sharing their thyroid experiences with the public, the Bushes have, once again, demonstrated their outstanding commitment to service of others.